Posted on Tue, Jul 27, 2010 : 5:59 a.m. Vault of Midnight comic book store owner Curtis Sullivan sits with a "Coney" toy at the front register of his Main Street store on Monday night. Winning the Will Eisner Spirit of Comics Retailer Award is an honor for a small store in a Midwest college town, Sullivan said. 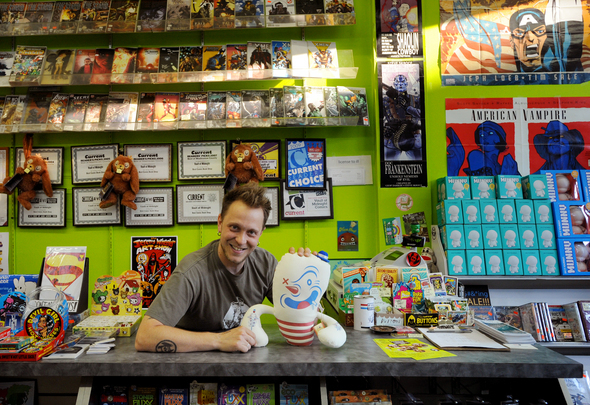 International retailers competed to earn the comic book industry’s equivalent of an Academy Award, but the winner was a downtown Ann Arbor retailer. Vault of Midnight was named the recipient of The Will Eisner Spirit of Comics Retailer Award Friday at the Eisner Comic Industry Awards during the 41st annual “Comic-Con” convention in San Diego. The award honors one store per year for supporting its community and the comic industry. Winning is an honor for a small store in a Midwest college town, co-owner Curtis Sullivan said. Competition was intense and it reflected major retail markets. “We’re the first and only store in Michigan to win,” he said. The award might be described as an Academy Award for the comic book industry, awarded to a store where the owners “have a genuine love and enthusiasm for the whole (comic book) medium,” Sullivan said. The nomination came in part from the store, which produced a 5-minute DVD on its 15-year history, and local writer Jim Ottaviani. Sullivan described the nomination as a “book report” on the store. While he wasn’t at the convention, Sullivan was watching blog reports from the event late Friday with his wife, Elizabeth. Their two kids, Dana and Kiley, tried to stay up, too, but fell asleep before the announcement came through. Winners of the award, Sullivan said, embody what he called the “gospel of comics,” respecting them as a body of work and not just a niche or genre. Some trends are reflected, but the inventory runs the gamut of comic books, he said. “We’re a bookstore that just happens to sell comic books,” Sullivan said. Vault of Midnight has been located at 219 S. Main St. - just north of East Liberty Street - for about 5 years, Sullivan said, and it’s existed in Ann Arbor for about 15 years. It stocks merchandise that includes the latest publications as well as issues dating back to the 1950s. It’s also one of downtown Ann Arbor’s destination retailers, with the bulk of its business coming from foot traffic through the store. Sullivan said about 5 percent of sales come from direct mail customers, with very few resulting from online sources. The store has five employees - including co-owner Steve Fodale - and Sullivan has considered opening a second store in Michigan. “We’ve been thinking about that for a while,” he said. But its commitment to Ann Arbor remains firm, Sullivan added. The 30-year comic book reader said he’s proud to have a store valued by both customers and the industry. Paula Gardner is Business News Director of AnnArbor.com. Contact her at 734-623-2586 or by e-mail. Sign up for the weekly Business Review newsletter, distributed every Thursday, here. Thu, Jul 29, 2010 : 1:18 a.m.
Curtis and Liz are superstars - beyond their comics business, what they do for the community with their events, sponsorship, and support is completely essential to the young (modern?) cultural life of Ann Arbor. As Curtis told me last week, he's all about "getting stuff done", and gets antsy with lots of "planning" and "talk". Amen, brother. JFDI. Wed, Jul 28, 2010 : 4:14 p.m.
a2miguy - The City Council doesn't approve who rents a pice of property...what are you talking about? When they first moved there I thought there was no way they could survive...i very glad to be proven wrong. I've only gone in there a couple times but good people for sure. Wed, Jul 28, 2010 : 6:55 a.m.
Great job! I don't live in Ann Arbor now, but I got my start with comic collecting at the Eye of Agamotto on Liberty back in the 1970's. I'm happy to see that the tradition of great service has continued. Wed, Jul 28, 2010 : 3:54 a.m.
@a2miguy-totally agree! These are the stores that made A2 great. Vault of Midnight is a great store, I love that place and on occasion will get a comic book or two from time to time. Unique stores like this used to be a staple of A2, but with chains coming in due to high rents in the campus and downtown area, A2 uniqueness is being lost. Tue, Jul 27, 2010 : 3:49 p.m. I don't know a thing about comics, but my husband enjoys them, and whenever I need a gift for him I head to the Vault to pick something out. Curtis is always helpful, upbeat and happy for the business. Thank you for being such a fun presence on Main Street! Congrats on your award! Tue, Jul 27, 2010 : 2:02 p.m. These are fine people who deserve to be noticed &amp; recognized for their efforts. VOM has had to move into ever larger spaces every few years because of their steady growth -even with the crapola economy we're experiencing. Other businesses would do well to examine their business plan. I sometimes wish they'd NOT get so successful -sometimes they run out of my favourite comix!!! Congrads to them &amp; continued prosperity. Tue, Jul 27, 2010 : 11:37 a.m. I think people in high rise glitzy condos like comic books and graphic novels too. Plus they have money to spend on them. VoM is always great and the staff is always ready to help. I have coworkers that make stops are VoM before the leave A2 because they can't find what they want elsewhere. Tue, Jul 27, 2010 : 11:19 a.m.
Hello, City Council, DDA, CofC... are you paying attention?? THIS is the type of business that made Ann Arbor what it is (or once was and fast becoming no longer). Not chain retailers. Not your high-rise glitzy condos that no one can afford. But rather SMALL BUSINESS. Congrats, Vault. You're what this town is all about. Tue, Jul 27, 2010 : 10:24 a.m.
Congratulations, VOM! I love this store - regardless of your level of expertise or interest in comics &amp; other products, the staff is always eager to help. Even if they don't have what you're looking for, they can find it (or at least empathize with your plight!!). Well earned recognition for a great store &amp; staff. Tue, Jul 27, 2010 : 9:54 a.m.
Tue, Jul 27, 2010 : 8:49 a.m.
Congrats to Vault of Midnight! It's a great store, always fun to poke around in. Tue, Jul 27, 2010 : 7:28 a.m. This is a great store - I've shopped in NYC and Chicago when I lived in those cities - VoM is outstanding! Their customer service is outstanding, their knowledge is unparalleled! Bravo - well deserved! You guys ROCK! Tue, Jul 27, 2010 : 7:24 a.m.
HUZZAH! I'm not a fanboy per se but it's clearly evident that the owners passion for their industry, unique product and attention to detail shine through and encapsulate what every small business owner should hope to accomplish. The storefront looks great! Take note Ann Arbor, Vault of Midnight embodies the recipe for success of a mainstreet retailer. Moar like this! Tue, Jul 27, 2010 : 7:03 a.m.
Congratulations! They also have an excellent program where they display local elementary school art work. Both of my kids were very proud to have their art work displayed in their store.